Knowing we wouldn't have much time in Phoenix after the wedding and before carrying on with our trip, I hadn't bothered to even look at the list of tourist attractions in the area. But when cousin Bonnie mentioned the Frank Lloyd Wright museum, I said Yes yes yes, that's exactly what I'd like to see. The cousins and Michael put their heads together, and came up with a plan to catch the noon guided tour, after which they'd drive us to Mesa to pick up our RV. All this was to happen after we attended the morning's farewell coffee and cake at the hospitality suite, courtesy of parents of the bride. So there was I eating chocolate chip cookies, drinking and schmoozing, when I felt something moist around my nose and grabbed a tissue just in time to catch a huge blob of blood. Darn, I said to myself, and retreated to a seat in the corner, applying more tissues and waiting for the onslaught to stop. Except it didn't. Bonnie, bless her, noticed that something was up and came to help, supplying me with fresh tissues and making the bloody ones disappear. I'm warning you again -- this is getting gory. You can stop reading right here, or skip to the Happy End at the bottom of the page. Nosebleeds are common in the hot, dry Arizona weather, it had been explained to me. Cousin Bob gets them whenever he visits the region. So I sat there, mildly annoyed but resigned, expecting the flow to become a dribble and stop. Except it didn't. Luckily, there was a doctor in the house: our host, Neil Shernoff MD. He took a quick look and said Yes, that's quite a nosebleed you got there. And hearing what meds I was on, he added that it would take my blood three times as long to clot. (Low-dosage Aspirin and other stuff which may be fine for preventing heart attacks are not so dandy when you're bleeding.) He said if the bleeding did not stop of its own accord within 45 minutes, I should go to the hospital E.R., where they would locate the ruptured blood vessel and cauterize it. Bonnie asked which hospital, and it was decided that the Mayo Clinic was probably the fastest to get to. There's nothing like having compassionate, efficient cousins around you in times of crisis. Before I knew it, Bob was driving us -- me, Michael and Bonnie -- to the hospital. Michael and Bonnie and the whispering GPS system, plus Neil's instructions drawn on the back of a paper plate, were Bob's navigational aids, and Bon was all the time replacing bloody tissues with fresh ones. I was chocking on my own blood, swallowing a lot and coughing and spitting some, feeling rather low. The Arizona Mayo Clinic pops up from the middle of nowhere. There's desert all around, fast roads, and suddenly there's a large building. Looked new, modern, clean, neat, with a barely-used sort of look-and-to it. Not the kind of inner-city hospital ERs that you see on melodramatic TV series. As opposed to the ERs I'm accustomed to -- in Ichilov (Tel Aviv), Assaf HaRofeh, and others -- where only a thin curtain separates one groaning patient from another, and more patients are placed in beds along corridor walls -- this was luxury: a small but neat room of my own, with chairs for Michael and Bonnie to my left. And they never left my side. Dr. Joseph M. Wood and an assisting nurse were extremely pleasant. Reassuringly relaxed and competent. Dr. Wood suctioned as much blood as he could from my mouth and nose, including one rather large, disgusting blob, then explained that he would dab an anesthetizing liquid inside the nostril then identify the offending vessel and cauterize it. The entire procedure was rather unpleasant but not unbearably so. I concentrated on a point on the wall and did a relaxation exercise, and both the nurse (so sorry I didn't write down her name at the time) and Dr. Wood kept murmuring encouraging words, about how well I was doing. As if I had much of a choice. At this point I complained that I could still feel a blob of blood in my throat that I could neither cough up nor swallow and that was really bothering me. Doc said if I opened wide and said Ahhh and didn't move, he might be able to get hold of it and pull it out. I did, and he did. Holy Mackerel! What he pulled out of my mouth looked like a 20 cm fish-shaped dark red bloody blob. UGH and YUCK are an understatement. But what a relief! Okay. The main event was over. Instructions, antibiotics, leave bandaged until Friday or so, take care, goodbye. Oh, and pay. We paid a down-payment of $300 by credit cared; the full bill will be sent by mail to our home address. I have no idea how much it will be, and am very curious. This is America, don't forget. We did, of course, issue insurance before our trip. And we did make sure to take the receipt and the doctor's report / release papers. So we'll be reimbursed for most of the sum, whatever it is. Outside the hospital, Bob and JoAnn were already waiting for us. We were all hungry, and stopped for lunch somewhere. (Though I could not really taste the food or enjoy it, nor properly swallow, even, with my nose all taped up.) 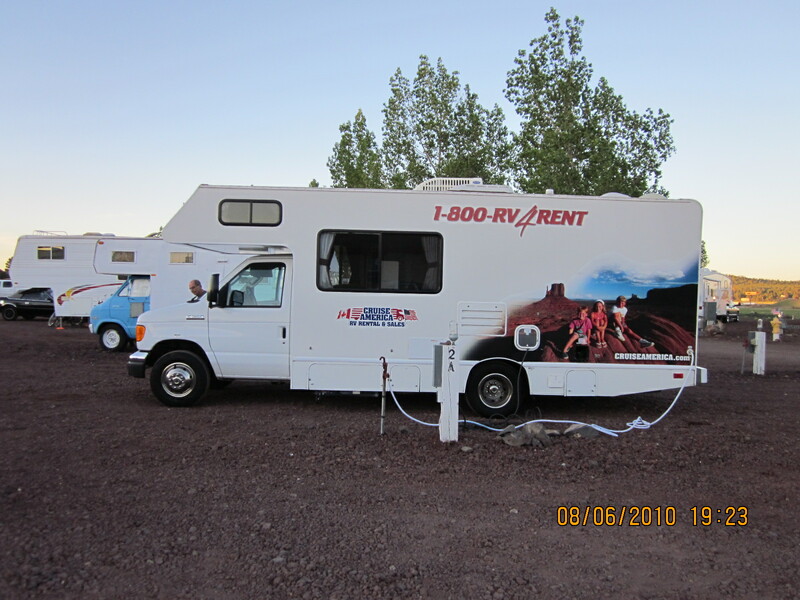 From there, Bob drove us all to Mesa, to CruiseAmerica, where we were to pick up the RV. My beloved cousins made sure everything was in order, and only then continued on their way. We watched an instructional video about the ins and outs of the vehicle, then were given a quick tour of the actual, er, car? As hard as I tried to concentrate, I wasn't absorbing much, and hoped that M was taking it all in. When we finally boarded it and began driving, it made such rattling noises that we turned around, returned it, and were given a different one -- very similar, but a bit older, I suspect. Michael carefully drove us back to the Tapatio Cliffs Resort, for our last night there, before embarking on the next leg of our journey. It was a very hot day. My nose hurt. The roof of my mouth hurt. My head ached. I couldn't breathe. The last thing I wanted was to explore the desert, by RV or any other way. But here I am, a week later, comfortably sitting at the dinette table, after a light supper and a nice cup of tea plus chocolates left over from the wedding as dessert... I can breathe, and I can drive the RV. Wherever I am, I'm also at home. Right to left: Bob & JoAnn Kirkland, Bonnie Kirkland, Steve Klein. Love you, guys! Apart from fascinating and very descriptive reading, I never realized you had such a nose for trouble! Nina כול הכבוד especially driving a big whopper. How are the new cameras working out? Avidly looking forward to installments. Oops, scratch that! Silly me. Of course I know how to upload pics. Was simply in the wrong tab. Will add pics next time. Remind me never to go to Arizona - that's just the type of event to send me into a major panic attack!